Broken Pipe, Plant City, FL | A Step Above Plumbing Inc. Broken Pipe, Plant City, FL | A Step Above Plumbing Inc.
Give us a call at A Step Above Plumbing Inc. to repair or replace your broken pipe in Plant City. The pipes in your home serve several important purposes, including moving water to the faucets and fixtures throughout the structure, as well as moving waste rinsed down drains the flushed down toilets. The pipes move the waste from your home to the sewer line or septic tank, so they serve critical roles in maintaining the health and sanitary conditions of the house. A broken sewage pipe can lead to serious concerns, especially if waste or contaminated water comes into your home and causes bacteria growth. A broken pipe that moves water through the house can also lead to flooding and water damage, so it’s important to get the problem fixed as quickly as possible. Plumbing issues are nearly always urgent, which is why our team at A Step Above Plumbing Inc. is available for emergency service 24 hours a day, 7 days a week. We’ll send someone to your commercial or residential property to assess the issue and give you a free estimate for repair. You might notice a few signs of a broken pipe, such as unpleasant odors, wet spots on the floor or ceilings, or the sounds of water bubbling or dripping. When you turn on your fixtures and dirty water comes through, this is another sign of a damaged pipe. You can experience a broken pipe as the result of freezing weather, which isn’t very common in Plant City, Florida, or when tree roots grow into the pipes beneath the ground and cause them to crack. 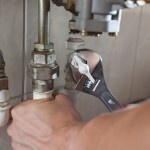 Give us a call at A Step Above Plumbing Inc. to repair or replace your broken pipe.